I begin writing this entry in the middle of Tropical Cyclone Pedring. Power went out for 6 hours and howling mad winds fell a couple of trees around the house; with one actually blocking the driveway for a time till maintenance chopped it up and cleared it. Pedring is, at this time, now over Baguio and should be out of of the country this evening. We are safe. And hope everyone else is. It was a bit cool today and ended up making soup over lunch. Thankfully we had supplies in the pantry. I adapted this simple recipe from the Dean & DeLuca Cookbook; partly choosing it because it was completely vegan and partly because it didn’t have a long list of ingredients. But the end result is a dish that tastes like it’s been laboriously prepped and stewed for ages. 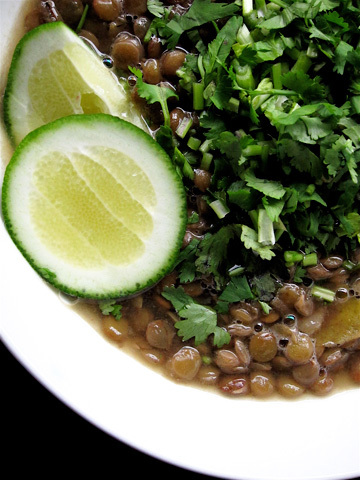 Lentils cook in a relatively short amount of time compared to other dried legumes; you can plate this dish and tuck-in in as little as 30 minutes. 1. Pour oil in a heavy saucepan over moderate heat. Add onion and spices, stirring, until onion begins to brown. 2. Add lentils, 8 strips of lemon rind and water. Bring to a boil then cover, reduce heat and simmer for 15 to 25 minutes (varies depending if you used split or whole lentils). Check and taste every so often after 15 minutes. I wanted the lentils to still be whole and a little firm so I turned off the heat after 2o minutes. Cook longer if you like it broken down and mushy. To cook/soften beans even quicker add a pinch of baking powder to the pot. 3. Season with salt and pepper to taste. Pour the soup into wide bowls and let cool for 15 minutes. 4. Rough chop cilantro and place a good spoonful atop every bowl, squeeze a wedge of lemon and sprinkle with red pepper flakes. For a lacto-vegetarian twist, you can mix in the chopped cilantro and lemon juice with a cup of thick yogurt and swirl a dollop of this mixture over each bowl. Both the yogurt and plain lemon version provided the pleasant acidity to counterpoint the earthy/nutty flavors of the lentil soup. A brief flash of sunshine on a dreary day. looks delicious. Thanks for this as I am trying to be vegetarian on some days. Will try it out and share with my senior citizen parents maybe this sunday. A little suggestion, every time cumin is needed in a recipe, try toasting whole seeds it in a pan in low fire and then grind it. Its another step in any recipe but this toasted and ground cumin will make any dish come alive. Thanks for the tip! I actually used whole spices then run them through a grinder before frying. So I should've toasted them in a dry pan before grinding then fry. Will keep in mind next time.